Stanberry, along with others looking at the issue, believes what’s needed is not more power, it’s more efficiently and strategically provided power. “Cars sit around 20, 21 hours a day. There’s plenty of time to charge – so quite a bit of flexibility,” said Dan Bowermaster, program manager for electric transportation at the Electric Power Research Institute, an independent non-profit center for public interest energy and environmental research, which has been looking at grid readiness for EVs. What credo would you choose: “Share and share alike?” or “To each his own”? The choice doesn’t relate only to material goods or socialism versus capitalism. It can also reflect attitudes about how we solve our collective problems, such as affordable access to health care or threats from climate change. 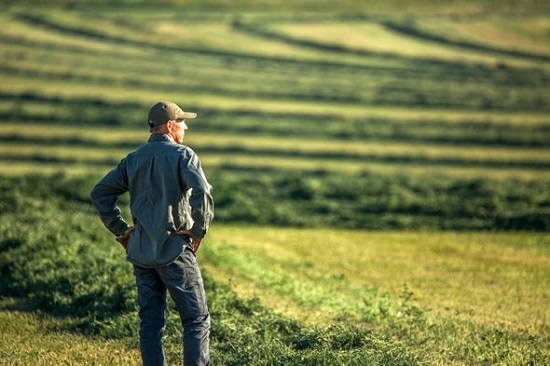 Despite the existence of shared resources in our lives—water, air, land, tax dollars—some people will lean into a go-it-alone approach, with each individual deciding for themselves what’s best. Others will look to group decision-making. What’s the tipping point for shifting from maverick to team player? Researchers at Leiden University, the Netherlands, addressed that question using a computer game in which students had to decide whether to use a set of virtual resources to solve a problem individually or collectively. The investigators found that these study participants had a “remarkable tendency” to waste resources for the sake of an independent solution rather than efficiently using what in the social sciences is referred to as “the commons.” The study results were published April 17 in ScienceAdvances. The choice to follow the loner track even if it means wasted resources probably sounds familiar. Such useless waste, a “tragedy of the commons,” as the authors call it, is one that societies face in all kinds of situations. Study author Jörg Gross, assistant professor at Leiden University’s Institute of Psychology, cites several examples of real-world problems from modern life that inspired the study, including use of public versus private transportation. After all, almost everyone needs to get from Location A to Location B. Rather than create universal public transit solutions, though, people more often turn to using private vehicles. This article was orginially published in December 2016 and was updated on April 7 2019 to include ClimateAdam's recently launched Patreon project. At a guess, many of you reading this post are already making good personal choices to help mitigate climate change. Some of you would perhaps like to do more. So, here are some suggestions where you can get actively involved either via crowdfunding, where you make a monetary donation or via crowdsourcing, where you donate your or your computer's time to sift through different sets of data. Adam Levy is a doctor in atmospheric physics from the University of Oxford. During his research he saw the huge gap between what we know about climate change and how we talk about it. So he created the ClimateAdam channel dedicated to explaining climate change in playful and engaging ways: everything from the crucial science to the actions we can all take. In order to grow his channel, he set up a Patreon project. Australia is the worlds’ largest exporter of coal, selling thermal coal for electricity generation and coking coal for smelting world-wide. In 2017 its export of this commodity was valued at over $40 billion, most of it produced in Queensland and New South Wales. In addition, coal is mined for domestic use with about 42.3 million tonnes,valued at over $4 billion being consumed in 2017, primarily for generating electricity. Federal and State governments make important financial gains from this through collection of royalties and income tax on coal production and sale. These gains enable governments to provide quality essential services which assist in maintaining a high standard of living for all Australians and sustain rural towns with steady employment provided directly by mining operations and related industries dependent on them. However, a problem with coal is that its mining involves emission of methane and Australia has 21 coal mines currently in operation. 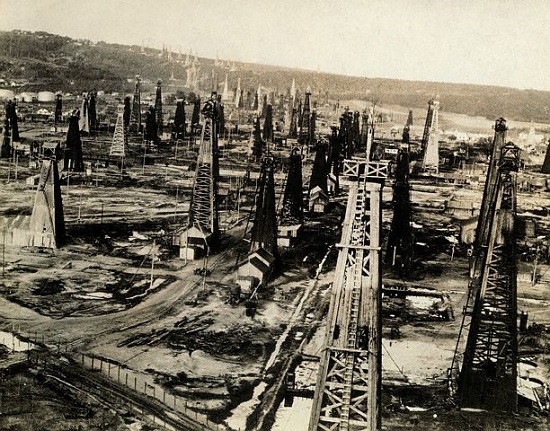 The volume of methane emitted by them is not accurately known nor is it known if those emissions are included in official estimates of national emissions. 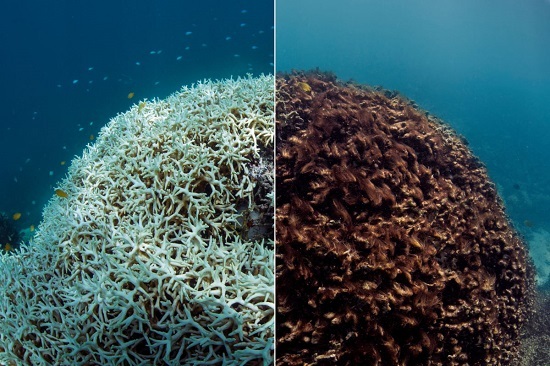 A more serious problem is that when burnt, coal produces carbon dioxide (CO2) and is estimated to be responsible for 30% of all CO2 emissions in Australia – and world wide. As such, coal production and combustion are major contributors to global warming and its effects on climate which in recent years have been marked by increases in the frequency and severity of weather events world-wide. These increases have prompted growing public protests, particularly by younger people and calls for governments to be more active in planning and acting to curb greenhouse gas emissions. Fig 1. Dead fish floating on the Darling River at Menindee, 2019. Rivers stopped flowing. 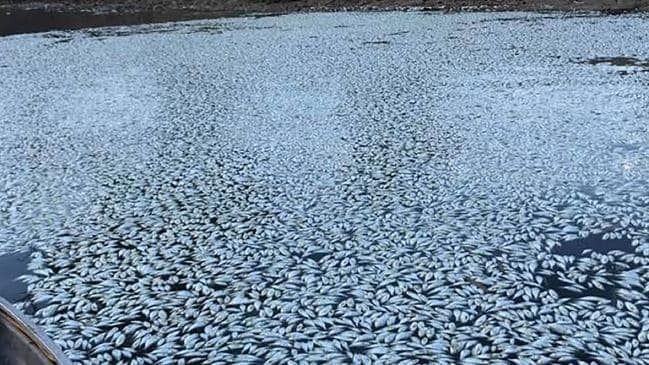 Over 1,000,000 fish died from hypoxia. Picture: Robert Gregory/AFP. Fig 2. 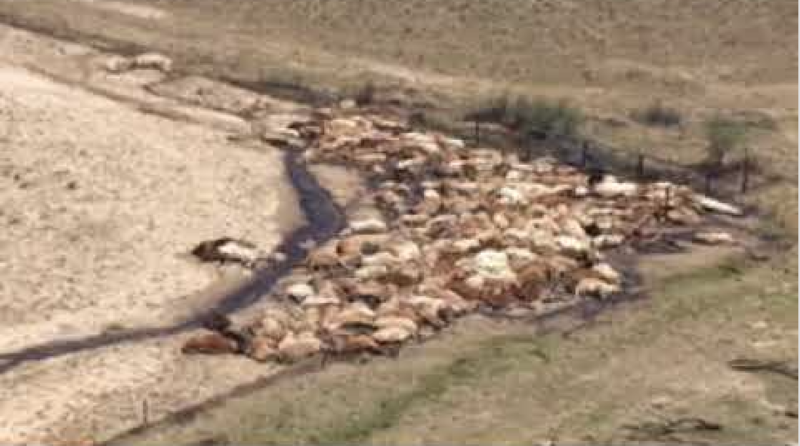 Livestock losses due to drowning in the 2019 North Queensland floods and subsequent starvation estimated at 500,000 head. Source: The Guardian. The issue here, in this month’s “This is Not Cool” video feature, is of course the potential that “clean” nuclear energy can help combat global warming by reducing future reliance on still more combustion of fossil fuels, in particular coal. A little background here: Many fear that the projected threats posed by a rapidly warming climate are so serious that “even” nuclear power may shine by comparison, reducing need for more combustion of coal and other fossil fuels, including natural gas. This theory holds that renewable and other “clean energy” sources can’t do enough, soon enough. So, are what independent videographer Peter Sinclair refers to as “green new nukes” the way to go? Or at least one of the ways to go? A nuclear power representative at one point in the video recalls often being asked by eager would-be customers, “Can we have it ready in six months?” Her reply: Think a decade or more, more like at least 15 years. Given that a new nuclear power plant getting underway today is unlikely to come online, on average, until around 2033, those seeing nukes as a silver bullet are engaging in “a complete boondoggle and a waste of money,” Stanford’s Mark Jacobson says. In the real world, concludes Hausfather of Berkeley, “new nuclear power is pretty much off the table” at least in the U.S. and in Western Europe, and “no new large build-out” is foreseeable. 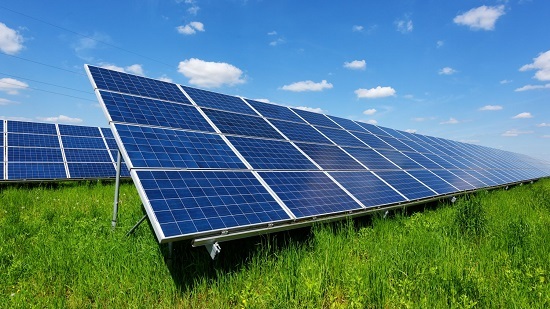 Like it or not, find it promising or find it inadequate, Hausfather says, renewables appear to present the most promising prospect, “sort of ideal” compared with other foreseeable and practical options. 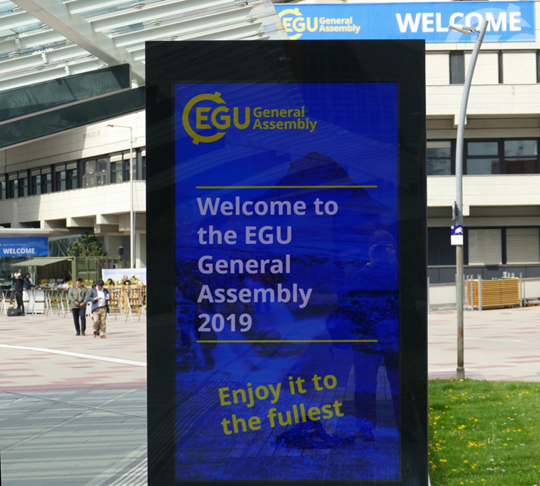 Just like last year, I travelled to Vienna to participate in the General Assembly of the European Geoscience Union (EGU) held from April 8 to 12. Different to 2018, I'll (try to) add to this blog on a daily basis, recounting what happened during each day as time allows. So please, remember to check back every once in a while to see any updates! I'll use the comment thread to highlight updates. This is a re-post from Carbon Brief. Prof Stephen Belcher is chief scientist at the UK Met Office; Dr Olivier Boucher is head of the Institut Pierre Simon Laplace (IPSL) Climate Modelling Centre; and Prof Rowan Sutton is director of climate research at the UK National Centre for Atmospheric Science (NCAS), University of Reading. Scientists have today revealed that thanks to new radar imaging system, a 20 km-wide asteroid is on a probable collision course with earth and they calculate it has an 85% probability of striking the planet between 23-25 August, 2046. 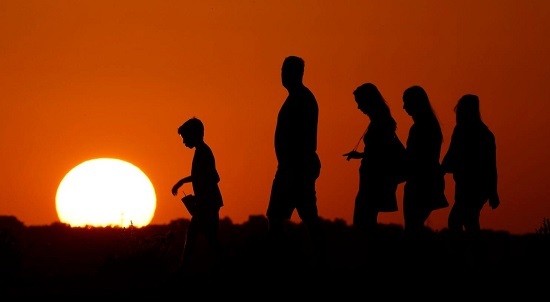 Observers from centers in Chile to Finland have confirmed the observations and are urging governments worldwide to begin efforts to avoid a global catastrophe. The plan is to mobilize industry and research together into an effort to deflect the asteroid before a collision. 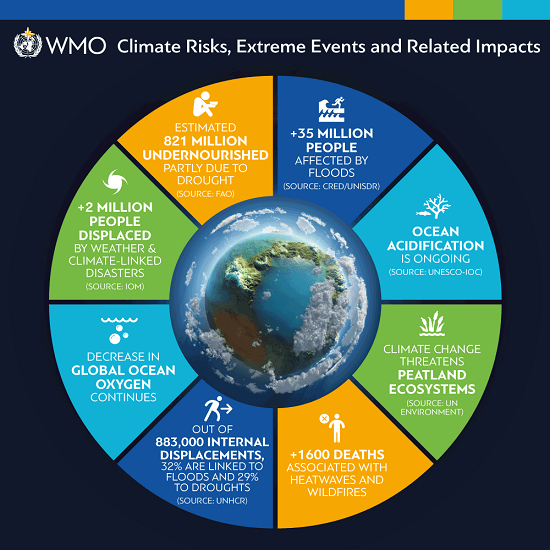 Briefed earlier in special meetings, the UN has formed an Intergovernmental Panel on Cosmic Catastrophe (IPCC), to consider options and advise governments. 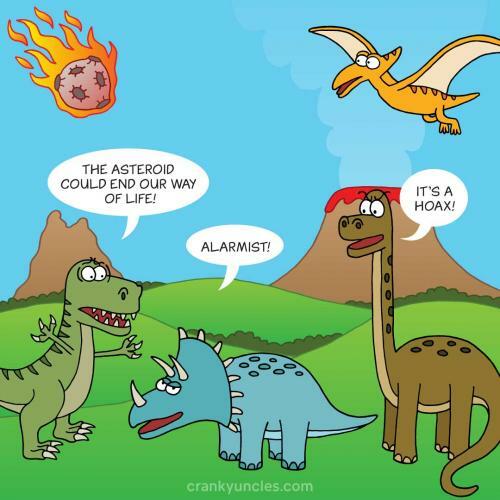 The asteroid is of a similar size to that associated with the dinosaur extinction. The plan however has immediately run into opposition from dozens of retired scientists and bloggers. “This is just alarmist talk based in computer models. So far there is no solution to the 3-body problem in gravity and this is clearly a much more complicated N-body problem. The system is chaotic and tiny errors in measurement will blow the computer models away” said Prof Al Kaos. He dismissed the accuracy with which solar orbits are determined and navigation of planetary rockets. “The dirty secret is that they are making course corrections all the time. Tell me how Hyperion will look next year before telling me where an asteroid will be in 2046”. Scientists acknowledged some uncertainty but have stuck to their probability estimate.